If you live in or are traveling through Colorado, you may have noticed smoke in the air Sunday, which became even heavier Monday. Fires burning in the Pacific Northwest and Montana are producing huge volumes of smoke that is being pulled into Colorado, particularly the eastern half of the state. Neighboring Wyoming, Nebraska and Kansas are also being blanketed with smoke that is giving the sky an orange tint. More than two dozen fires are burning in western Oregon and Washington, and another dozen or more are burning in Montana. 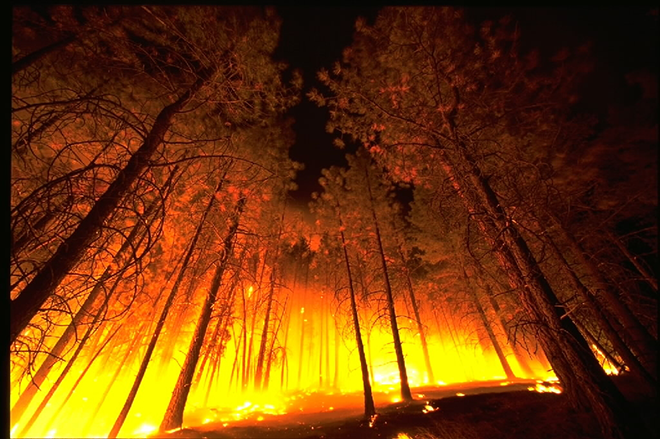 Across the three states, hundreds of thousands of acres have been charred - 500,000 acres in Montana alone. 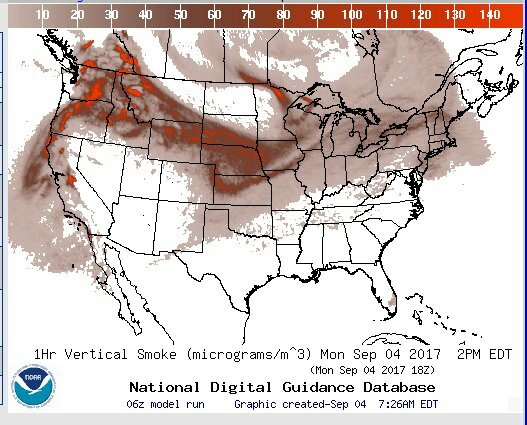 Fires burning in California are not yet contributing significantly to smoke flowing into Colorado. The Colorado Department of Public Health and Environment has issued air quality advisories for nearly all of eastern Colorado below 7,000 feet. Locations impacted included Denver, Boulder, Ft. Collins, Greeley, Colorado Springs, Pueblo, Ft Morgan, Sterling, Julesburg, Holyoke, Boulder, Broomfield, Brighton, Littleton, Akron, Wray, Castle Rock, Kiowa, Hugo, Burlington, Cheyenne Wells, Ordway, Eads, La Junta, Las Animas, Lamar, Trinidad and Springfield. The advisory went into effect Monday at 9:00 a.m., and is expected to continue into Tuesday morning. CDPHE says that if smoke is thick or becomes thick in your neighborhood you may want to remain indoors. This is especially true for those with heart disease, respiratory illnesses, the very young, and the elderly. Consider limiting outdoor activity when moderate to heavy smoke is present. Consider relocating temporarily if smoke is present indoors and is making you ill. If visibility is less than 5 miles in smoke in your neighborhood, smoke has reached levels that are unhealthy. Smoke is expected to decrease slowly Monday afternoon into the evening. Across the eastern plains for Labor Day, temperatures will be in the upper 80s to low 90s. Areas along Highway 50 and the Arkansas River can expect mid- to upper 90s. There is a chance for isolated showers and thunderstorms later in the afternoon. Tuesday's temperatures will be as much as 20 to 25 degrees cooler over eastern Colorado as a cold front drops out of the north. In addition to providing welcome relief from the heat, the front will also help clear smoke from the air. Wednesday's highs will rebound somewhat, but will still be ten or more degrees cooler than Monday.